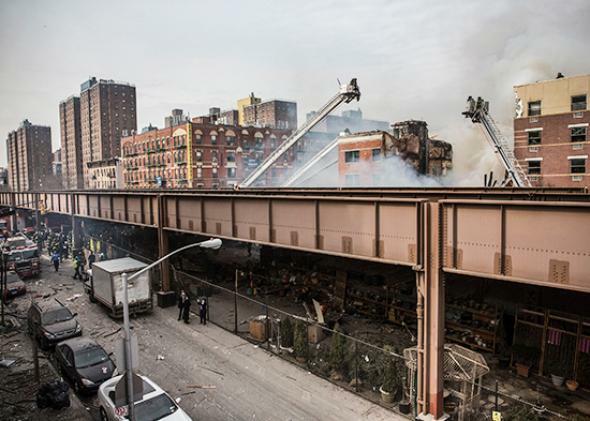 Harlem explosion: Gas infrastructure in New York and other cities needs major improvements to be safe. Firefighters responding to the 5-alarm fire and building collapse on Park Avenue in Harlem. This may be a warning for New York City and other urban areas. A report out Tuesday from the Center for an Urban Future reveals that New York City’s infrastructure is extremely old. It may not be surprising, exactly, given that New York is known to have been densely populated for hundreds of years, but seeing it all laid out is still pretty stunning. If it wasn’t worth addressing before, the Harlem accident—which left at least two dead and many injured—should make it worth it now. *Correction, March 12, 2014: Due to an editing error, this post originally misstated that a resident of a collapsed building called to report a smell of gas 20 minutes before the explosion. The call came from someone who lives nearby, but not in an affected building.